A 'Ragged School' Gives U.K. Children A Taste Of Dickensian Destitution The East End of London was once synonymous with Dickensian squalor. Now it's prime real estate. A tiny museum in the back streets shows schoolchildren what life was like in the past. Sally Armstrong, who plays the role of ragged school teacher Miss Perkins, stands her ground. Miss Perkins stands on a creaking wooden floorboard, peering over wire-rimmed glasses. With a bang of her cane on a small wooden desk, she instructs her students to repeat after her: "Four farthing equals one penny." "Four farthing equals one penny," answer the 9- and 10-year-olds. The children sit on stools, slate boards on their laps, alongside a wall with a replica 19th century sepia map showcasing the British Empire. 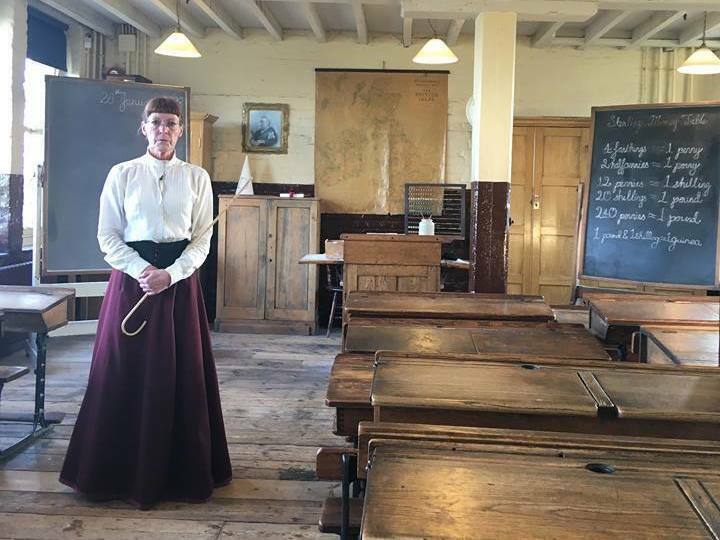 They've stepped into the past at the Ragged School Museum, which allows British kids a glimpse into life as destitute Londoners of the Victorian era. The museum, which sits alongside a canal that runs through London's East End, is hosted in a warehouse that once provided free education for London's most disadvantaged 19th century children. A list describing the backgrounds of children who attended the school reads, in part: "fatherless, fatherless, labourer, father in consumption." Having a "father out of work would really mean destitution at that time, because a woman could not make a decent living," said museum director Erica Davies. Ragged schools "were usually set up by philanthropists to educate the very poorest children in society who couldn't afford to go to school," she said. Teachers would instruct students in basic grammar and arithmetic. Often stern — like Charles Dickens' Mr. Gradgrind from Hard Times — teachers would verbally discipline students and dish out dunce caps to those slow in their lessons. Now, about 16,000 British children each year follow a day in the life of those students — dunce caps and all — at the museum, which hosts classes every weekday. Sally Armstrong, a 59-year-old actress, leads those classes, and has been playing the part of Miss Perkins for 11 years. She shows visiting children the unusual tools Victorians used to instill discipline in the street children — like a wooden board with finger holes tied behind children's backs to stop fidgeting fingers — and is always fiercely in character. "You can't do stuff that you do now," reflected 10-year-old Victoria Tolaje after class. "If you were in the Victorian times, you would probably get caned or something." "Our teacher is quite nice and she doesn't notice a lot of things. She noticed everything," added 9-year-old Ella Love, pointing to Miss Perkins. The museum is an exercise that allows children today to imagine the effects of poverty, Armstrong said: "They haven't got a clue about not having any food in the house, there being no welfare state or the fact that they would be expected to go out to work as well as go to school." 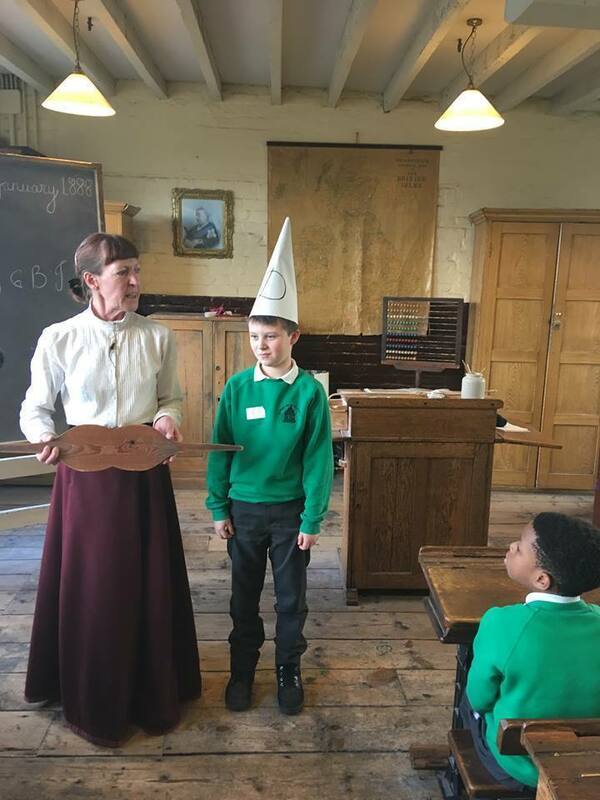 Miss Perkins chastises a visiting student with a dunce cap. The museum itself is struggling. The building's roof leaks when it rains. The Ragged School has gone from making most of its money through government grants to having to earn most of its income after government budget cuts eliminated most of those grants. Davies has tried to get creative in earning that income, and 10 years ago, she started renting out some of the space for fashion photo shoots. Three years ago, she had to lay off half of her staff. Davies expects that the museum will receive a grant that will cover much-needed restoration work, but she adds that each year it gets harder for the Ragged School to stay afloat. "My cherished hope," she said, "is that we'll be able to get a group of supporters who'll realize the importance of the work we do, the significance of engaging children in education."